In the most inspiring speech of his career, Ted Kennedy once vowed: "For all those whose cares have been our concern, the work goes on, the cause endures, the hope still lives, and the dream shall never die." Unlike his martyred brothers, John and Robert, whose lives were cut off before the promise of a better future could be realized, Ted lived long enough to make many promises come true. During a career that spanned an astonishing half-century, he put his imprint on every major piece of progressive legislation–from health care and education to civil rights. There were times during that career–such as after the incident in Chappaquiddick–when Ted seemed to have surrendered to his demons. But there were other times–after one of his inspiring speeches on the floor of the Senate, for example–when he was compared to Henry Clay, Daniel Webster, John Calhoun, and other great lawmakers of the past. Indeed, for most of his life, Ted Kennedy played a kaleidoscope of roles–from destructive thrill seeker to constructive lawmaker; from straying husband to devoted father and uncle. 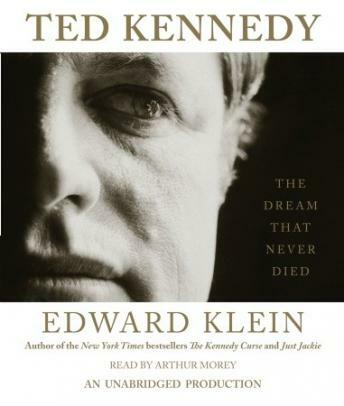 In Ted Kennedy: The Dream That Never Died, celebrated Kennedy biographer Edward Klein at last reconciles these contradictions, painting a stunningly original, up-to-the-moment portrait of Ted Kennedy and his remarkable late-in-life redemption. • Why Caroline Kennedy, at Ted’s urging, aspired to fill the New York Senate vacancy but then suddenly and unexpectedly withdrew her candidacy. • How Ted ended his longest-lasting romantic relationship to marry Victoria Reggie, and the unexpected effect that union had on his personal and political redemption. • What transpired between the parents of Mary Jo Kopechne and Ted Kennedy during two private meetings at Ted’s home. • Which feuds are likely to erupt within the Kennedy family in the wake of Ted’s demise, and what will become of Ted’s fortune and political legacy. Ted Kennedy: The Dream That Never Died does not shrink from portraying the erratic side of Ted Kennedy and his former wife, Joan. But both in spirit and tone, it is a compassionate celebration of a complex man who, in the winter of his life, summoned the best in himself to come to the aid of his troubled nation.